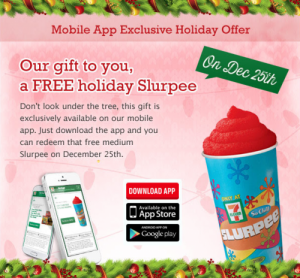 Download the 7-Eleven app (available for iOS and Android) and get the gift of a free medium Slurpee on Christmas Day from any 7-Eleven store. This offer is available for current and new app users. 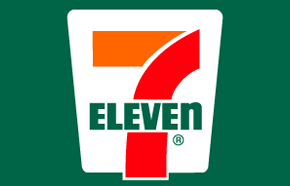 If you do not have the app, it is worth downloading, they often have coupons valid for a free drink valid for one day, I just wish we had a 7-Eleven closer so I could take advantage of them more often. If you do not have the app, new users will also receive a coupon for a free Cappuccino, Latte, Coffee or Hot Chocolate (mini marshmallows included!). Some stores may be closed on Christmas Day so you may want to call ahead before going. Click here to find a store or download the app.